William Jefferson Gatewood, 1801-1842, was serving in the Illinois State Senate when he died suddenly of a heart attack in Springfield, Illinois, on Saturday, 8 January 1842. He died at night, in his lodgings in Springfield, of a heart attack, according to various sources. His wife, Elewisa, and children would have been living back in Gallatin County, which he represented, at the time. One source says he died on the floor of the state Supreme Court and another had his death on the floor of the legislature. If he died on Saturday night, it was more likely at his lodgings. He was only thirty-eight years old. He was buried in the Old City Graveyard in downtown Springfield. A resolution was passed in 1872 in the Senate which would have reinterred the remains of several former members of the Senate and House “which now repose in the uncared-for cemetery grounds of Springfield, with a view of removing such mortal remains to a more suitable place.” The cemetery is long gone and the burials were supposedly removed to Oak Ridge Cemetery in Springfield, where Abraham Lincoln is buried. He was very popular and was at the time of his death a member of the state legislature. He died at Springfield, in the winter of 1841, during a session of the state senate. Some years after his death it was remarkd by persons living in this and other counties, "Had Gatewood lived he would have been the next United States senator." 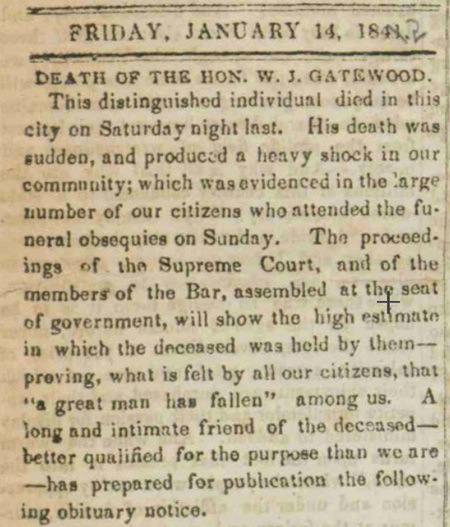 The above article and obituary appeared in the Sangamo Journal, Springfield, Illinois, 14 Jan 1842, the Friday following William Jefferson Gatewood's death. 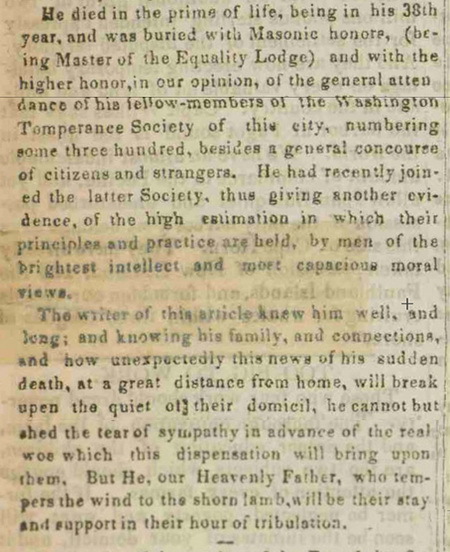 The date at the beginning of the article is Friday, January 14, 1841, with the 1 crossed out and a 2 written in - a mistake often made at the beginning of a new year. It is available in digital format at http://idnc.library.illinois.edu/, Illinois Digital Newspaper Collections, University Library, University of Illinois at Urbana-Champaign. 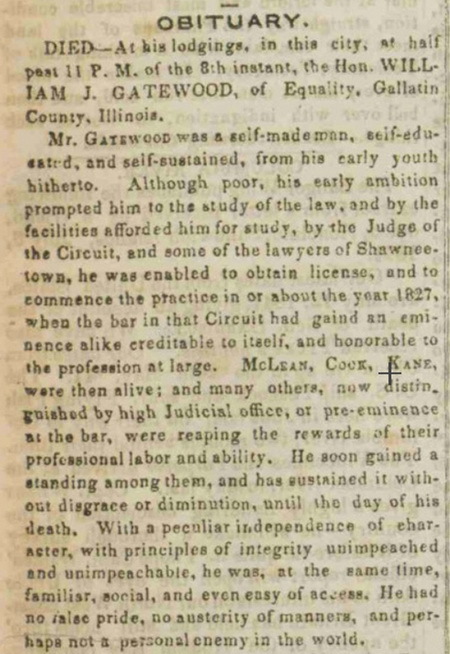 The quote above from The Bench and Bar of Illinois, Historical and Reminiscent, vol. 2, edited by John M. Palmer, Chicago: Lewis Publishing Co, 1899, p.852, is available at Open Library, benchandbarilli00palmgoog.